The Presidential Pedestal Urn and Flag Case are crafted from solid walnut with a beautiful dark cherry finish (shown), or Heirloom Walnut finish and made in the USA. The premium, American made urn features an embossed Great Seal of the United States on the beveled glass front. The hinged lid contains a hidden magnetic closure that will keep your flag dust free. 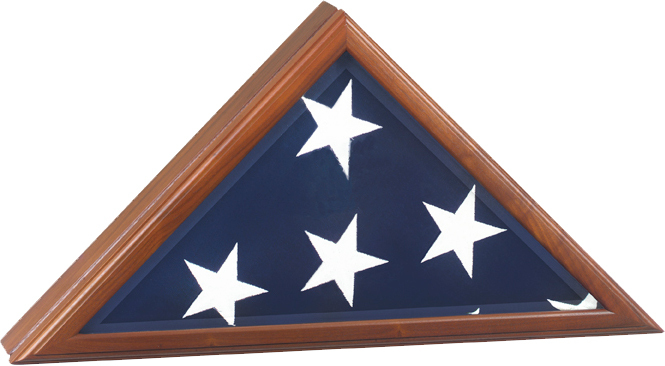 This beautiful flag case fits a standard U.S flag of with dimensions of 5' by 9 1/2 '. Three lines of engraving on the nameplate is recommended, however, the nameplate can accommodate a maximum of four lines of engraving. Please limit engraving to approximately 44 characters/spaces per line. The custom engraved nameplate will ship separately via USPS even for expedited orders. Nameplates usually ship 2-3 business days after order is placed. Please call if you need the nameplate immediately. This pedestal urn measures 27 1/2" x 3" x 5 7/8" and has a volume of 225 cubic inches. The pedestal urn inside dimensions are 25 1/4" x 12 3/4" x 4 1/4"
Flag case outside dimensions are 25 1/4" x 12 3/4" x 4 1/4". Please allow one business day after order is submitted before item ships. Note: Weights are calculated using UPS dimensional weight. Actual shipping weight is about 14 pounds.